Publisher Wales Interactive and developer Milky Tea Studios released Coffin Dodgers on Steam back in 2015. The quirky racer would later come to Xbox One and Playstation 4. Now, nearly three years later, Coffin Dodgers will finally race its way onto the Nintendo Switch. 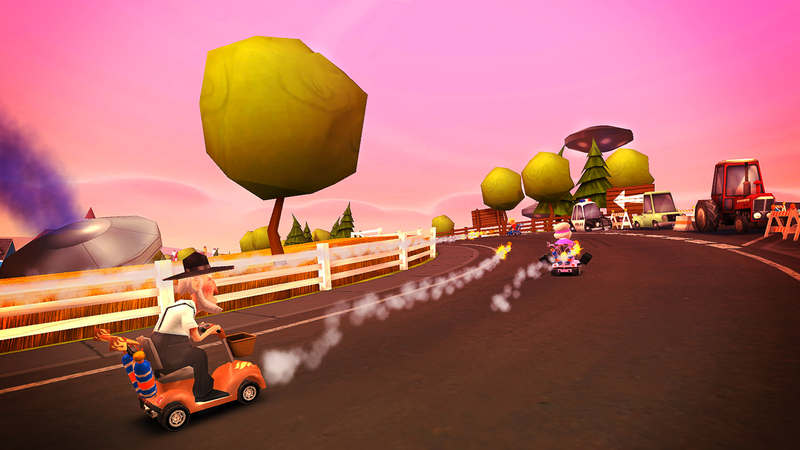 Coffin Dodgers is a quirky and dark spin on Mario Kart-style racing. Instead of playing the likes of Peach and Toad, you choose one of seven residents from the retirement village, Sunny Pines, who all ride on mobility scooters armed to the brim with homemade weapons. “Why?” you may be asking yourself. The Grim Reaper of course! Death itself has sent out his army of zombies to do his bidding and it is your goal to race Death and other players without biting the dust. Coffin Dodgers features 13 unique race tracks, multiplayer, a single-player story mode, a time trial mode, and other creative modes like Crazy Granddad, which sounds promising. For all you couch co-op fans, Coffin Dodgers also supports local co-op for up to four players as well. Coffin Dodgers is headed to the Nintendo Switch eShop on March 13 with a $12.99 price tag. Until then, you can prepare for the geriatric action on Nintendo Switch in the Coffin Dodgers trailer above.